The young hunter Adonis reassures the goddess Venus that she should not fear for his well-being as he sets out for the hunt. In fact, he will be killed by a wild boar. Venus's chariot at the right and the white doves at her feet help to identify the goddess. 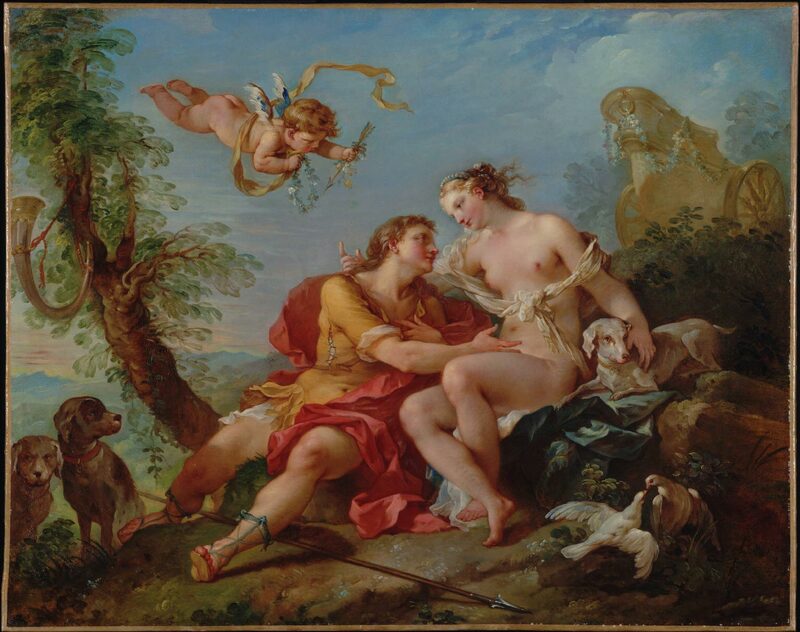 The flying cupid emphasizes the passionate nature of the lovers' dialogue. Possibly de Vouge sale, Paillet, Paris, March 15, 1784 . Possibly the Pallavicini Collection, Rome; sold to Freiherr Ferdinand Eduard von Stumm (1843-1925), Florence and Schloß Holzhausen, Hessen, Germany, early 1900s; sold to a private collection, Germany ; sold to Galerie Cailleux, Paris, by 1989; sold to PMA through the Friends of the Philadelphia Museum of Art, June 5, 1989. 1. Described as a "Départ d'Adonis pour la chasse", 94 x 118 cm. 2. The preceding provenance according to the dealer Cailleux (curatorial file). Von Stumm was the German ambassador to the court of Madrid from 1887-1892. Not in his estate sale, Gunther Deneke Auktionhaus, Berlin, October 4, 1932.